Text and photography copyright Sriharsha Ganjam. All rights reserved. We have all seen how the 3D craze is catching up these days, with everything from Televisions to Mobile phones going 3D. So why should nature photography be any different? In a first of its kind anywhere, Landscape Wizards bring to you a quick guide on how to make your own 3D landscape images which literally jumps to life. Its simple (can be done using your regular camera) and quite literally produce eye popping results! Its another unique and original creation from Landscape Wizards. The Big 3 behind 3D images! Angle of View during the photo shoot. Channel Processing during the Photo processing to make an anaglyph. Groovy 3D glasses to view your images. 3D works and relies on Stereoscopic vision. We accomplish this from our two independent eyes. It will be interesting to note that we fail to grasp the sense of depth or see in 3D when we view our natural world with only one eye. Here is a simple test to demonstrate this. Close your left eye and try to touch your left index finger with your right index finger. Its not as easy as when you have both your eyes open! That’s because with just one eye we fail to perceive the sense of depth which is crucial for this task. So why do having 2 eyes play such a pivotal role in 3D vision? The answer is simple, Angle of view! If you notice the image seen by our left eye is slightly different and offset as when compared to the image seen by our right eye. That’s because the two eyes are separated by a small distance on the face. Now when our brain processes the two images and merges it into one, it takes into consideration the differences between the two images and converts the difference into the Third Dimension which we perceive as Thickness or Depth or Separation, all of which are a crucial metric for sensing in 3D. Making 3D images also relies on this Angle of View theory. Just as our brain sees 2 different images we also need to make 2 different images, with each image simulating the view from each eye. So start by choosing a landscape which has lots of foreground and background. The more foreground and background you have, the better. Now focus on your subject (usually in-between the foreground and background) and take a picture. Move slightly to either your left or right keeping the camera absolutely horizontal during the movement (Use a tripod if you want really accurate results). The movement should just about be the same as the distance between your eyes. Now take the second image by refocusing on the same subject. We now have two images of the landscape each simulating the view from each eye. These two images now need to be processed to produce a single 3D image or what is called an “Anaglyph”. An Anaglyphic image captures Stereoscopic 3D data and presents it in a 2D image using two chromatically opposite colors (usually Red and Blue). In reality it’s a superimposed image of the two images we made earlier. One image is shown in Red and the other in Blue. When super imposed the images are slightly offset to produce the sense of Depth. The more the distance between the Blue and Red image the closer or further the image feels when viewed in 3D. After this is done, go to Image 2 and do a Ctrl + A to select the entire image and copy Image 2 and paste it on Image1 as a new layer. Now double click on the Layer1 highlighted in Blue to bring up the Layer Style dialogue box. Uncheck the “R” box circled in the screen shot below, and hit OK.
Now hit the “V” key on your keyboard to bring the “Move” tool. Click on Image 2 now and move the image carefully till you align the point of focus to lie exactly on top of the point of focus in Image 1 (The cactus in my image below). Once this is done only the point of focus appears to be in sharp focus while everything else seems to have a Red/Blue shadow. Now select the Crop tool to crop out the edges of your image which are not aligned. Your Anaglyph is done! An Anaglyphic image by itself will look woozy and unclear. To feel the 3D we need to have a pair of Anaglyphic glasses. Anaglyphic glasses have a Blue filter on the Right eye and a Red filter on the Left eye. They are simple to make and will form a nice paper project if you give them to kids in your house. Feel free to download the template we have provided for you on Landscape wizards site, to make your own Anaglyphic glasses. The one thing that you still need to get however is transparent Red and Blue Cellophane. These are easily available from any stationary shop selling books and paper. If you however feel like owning a good quality Anaglyphic glass which is more robust and classy or are unable to make them yourself, then please feel free to write to us at and we can have them shipped to you at a nominal cost. Once you have your glasses pop em on and see your images Pop out of the computer screen! 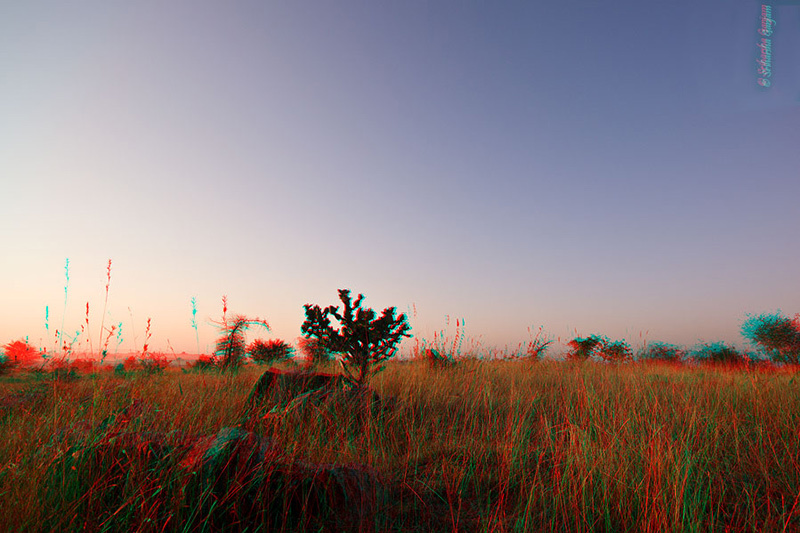 Please do tell us how you liked this article and don’t hesitate to share your 3D Anaglyphs on Landscape Wizards Forums, we all have Anaglyphic glasses at Landscape Wizards and would love to see your images “jump out”. Wow, that’s cool! Very creative! Thank you so much for this; great to learn something new; should be very interesting and exciting to create some ‘anaglyphs’ and see the subjects pop. Fantastic work guys. Keep them going.